Cardboard sleeve (mini LP) reissue from Bill Evans featuring the high-fidelity SHM-CD format (compatible with standard CD players) and the latest 24bit/96kHz digital remastering. Part of a 5-album Bill Evans SHM-CD cardboard sleeve reissue series featuring albums "I Will Say Goodbye," "Alone (Again)," "Intuition," "Re: Person I Knew," and "Jazzhouse." 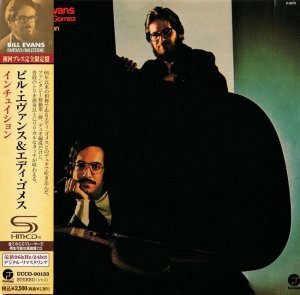 After seven years of their close relationship in his trio, Bill Evans in 1974 finally realized his dream of recording a duo album with bassist Eddie Gomez. Intuition is that album. 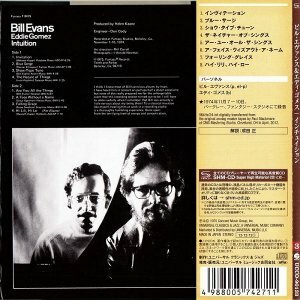 One of the most brilliant of the young bassists influenced by Scott LaFaro, Gomez continued development of the role of the bass in Evans's trio as a fully contributory voice, not just a member of the rhythm section.